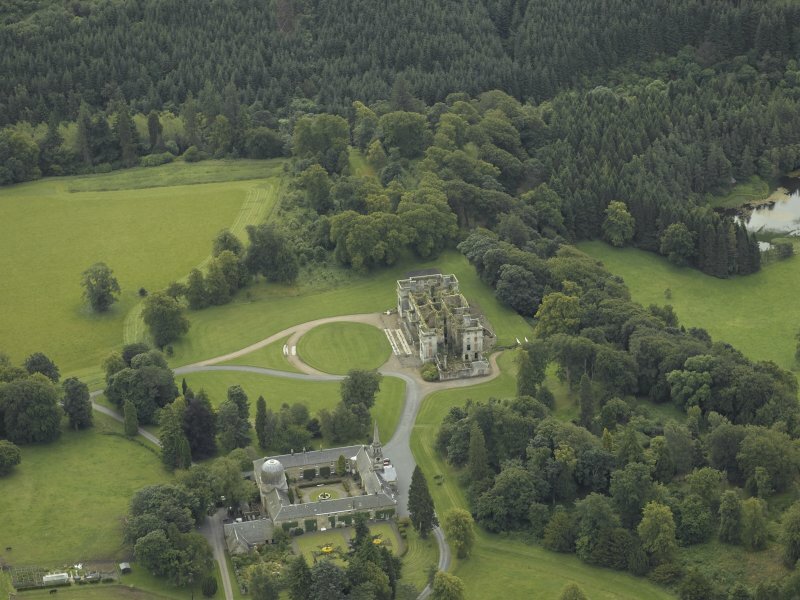 Oblique aerial view of Penicuik House, looking ENE. 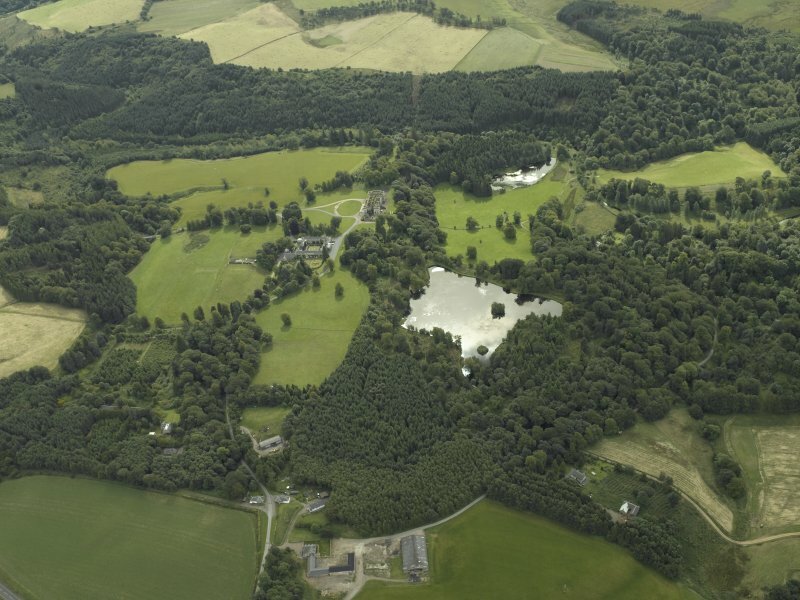 Oblique aerial view of Penicuik House, looking SSE. 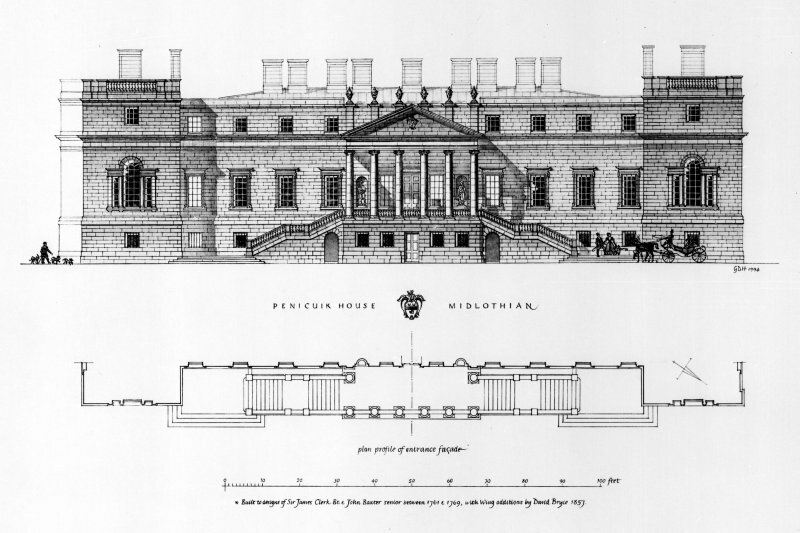 Plan of staircase ceiling of 1782 for Penicuik House. 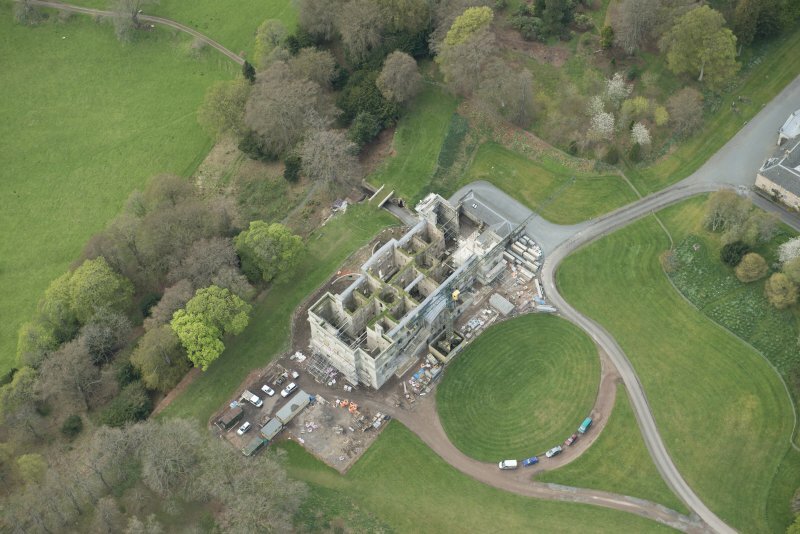 Digital copy of view from W.
Oblique aerial view centred on the stables and the ruins of the house, taken from the NE. 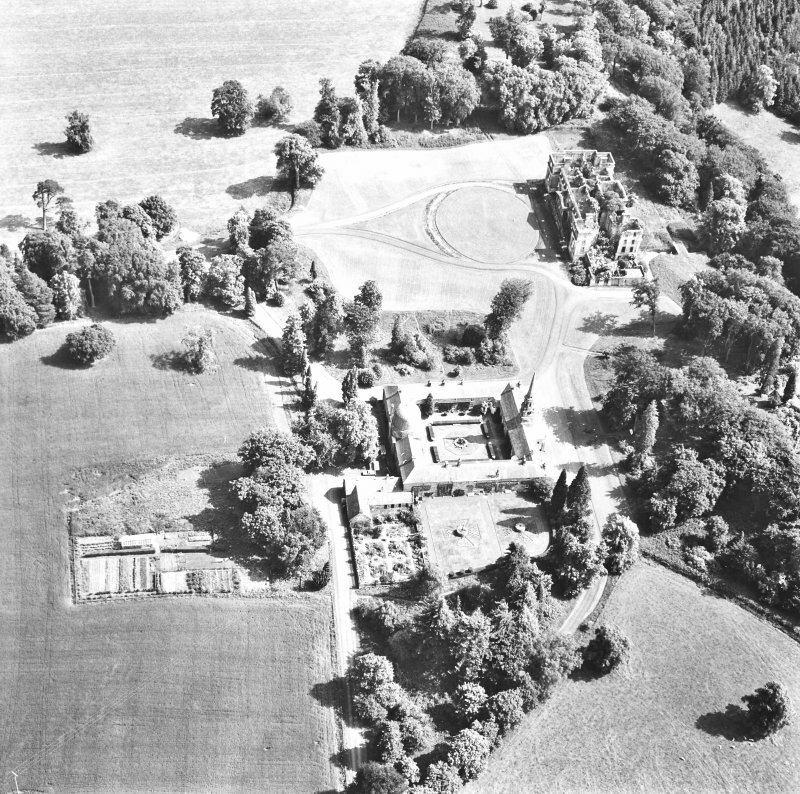 Oblique aerial view centred on the stables and the ruins of the house, taken from the ENE. 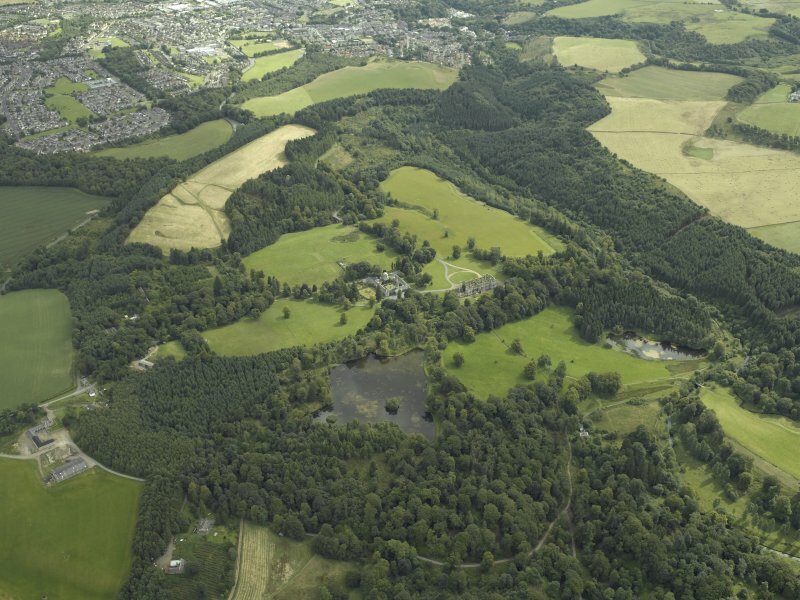 General oblique aerial view of the Penicuik House and stables, looking SW.
Oblique aerial view of Penicuik House, looking W.
Oblique aerial view centred on the stables and the ruins of the house, taken from the NNE. 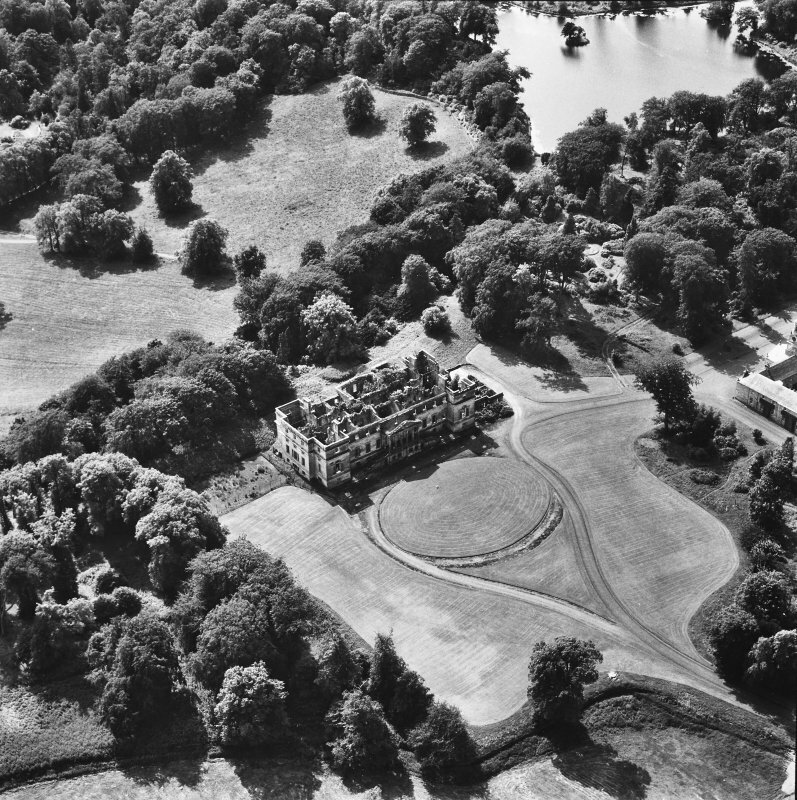 General oblique aerial view centred on the house and policies, taken from the NNE. 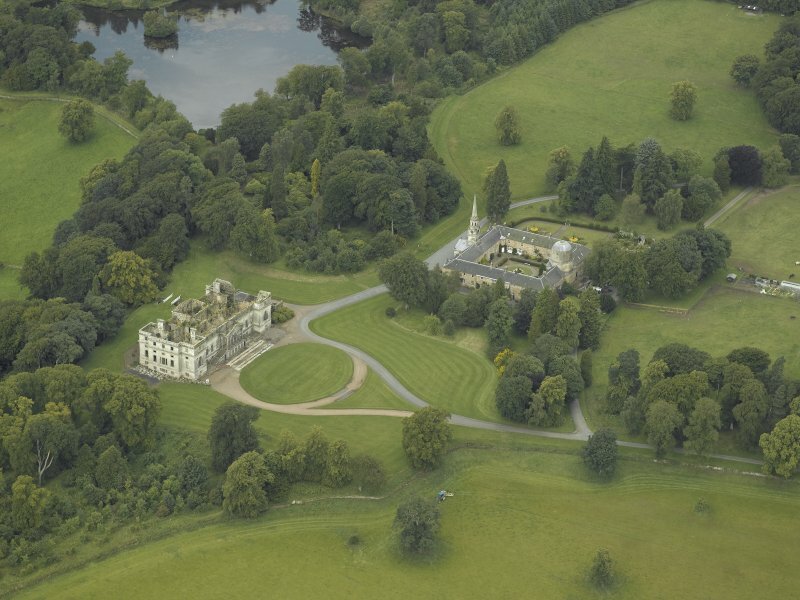 Oblique aerial view of Penicuik House, looking WNW. 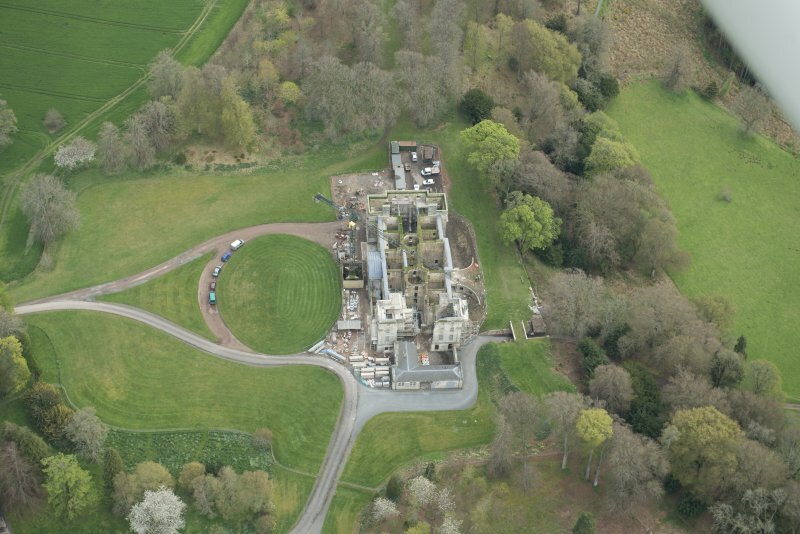 Oblique aerial view centred on the stables and the ruins of the house, taken from the NNW. 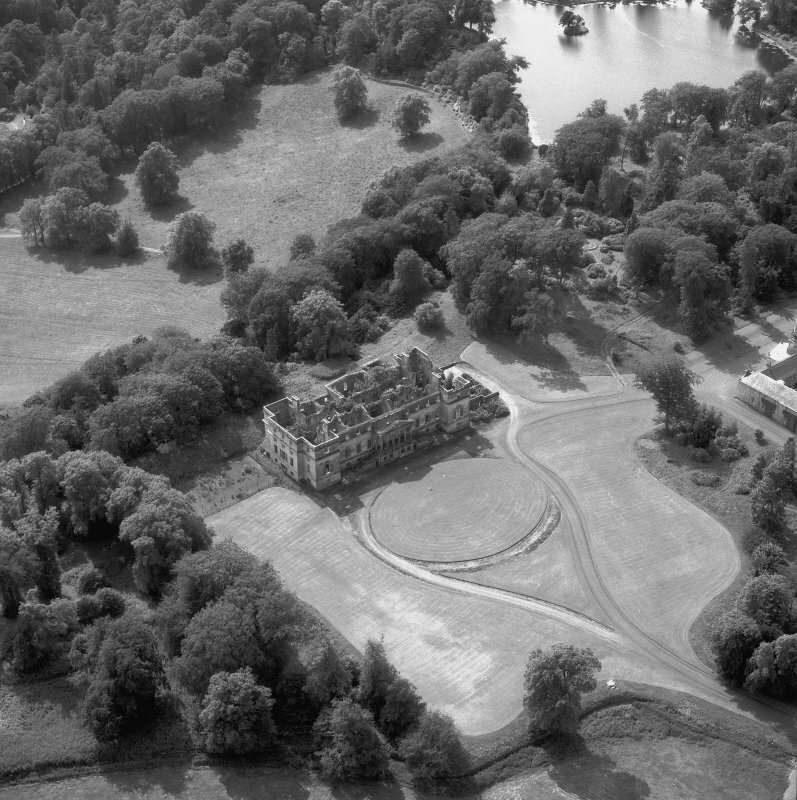 Oblique aerial view centred on the stables and the ruins of the house, taken from the N.
General oblique aerial view centred on the house and policies, taken from the NW. 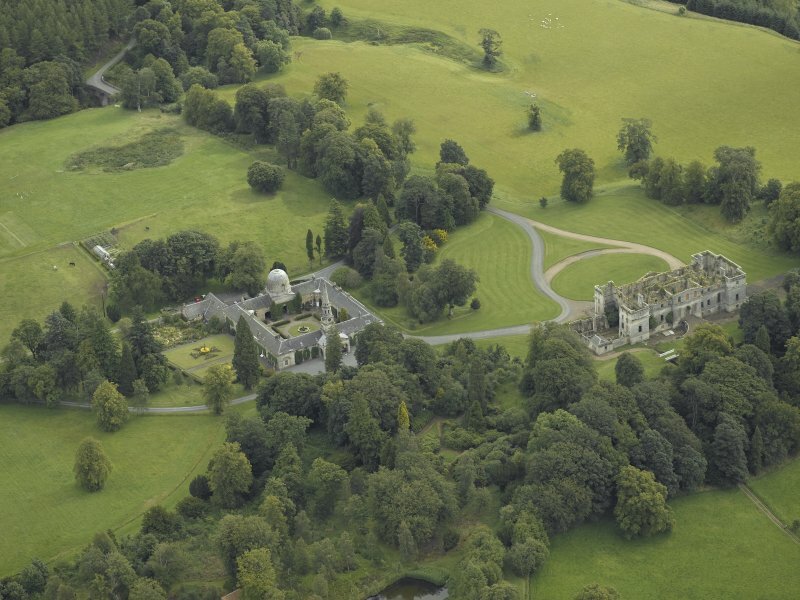 Oblique aerial view centred on the ruins of the house with the stables adjacent, taken from the SSE. 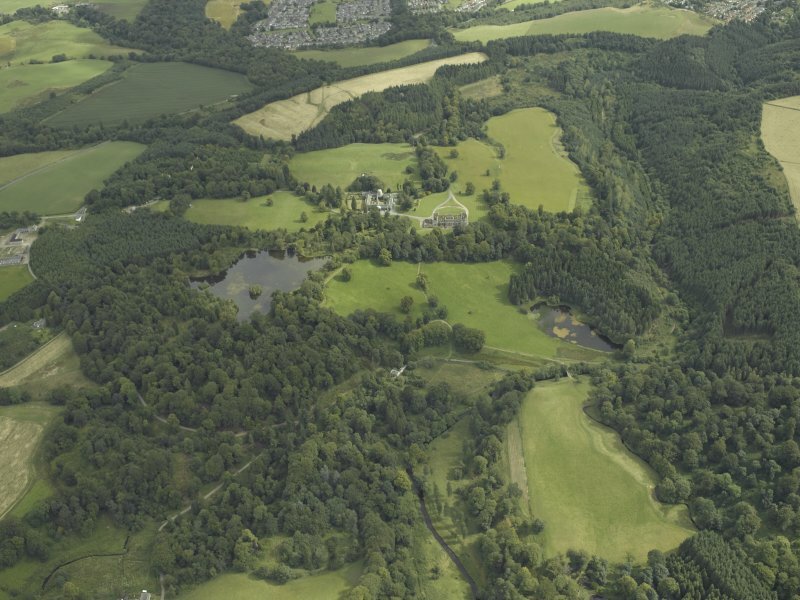 Oblique aerial view of Penicuik House, looking N.
Oblique aerial view of Penicuik House, looking NNE. 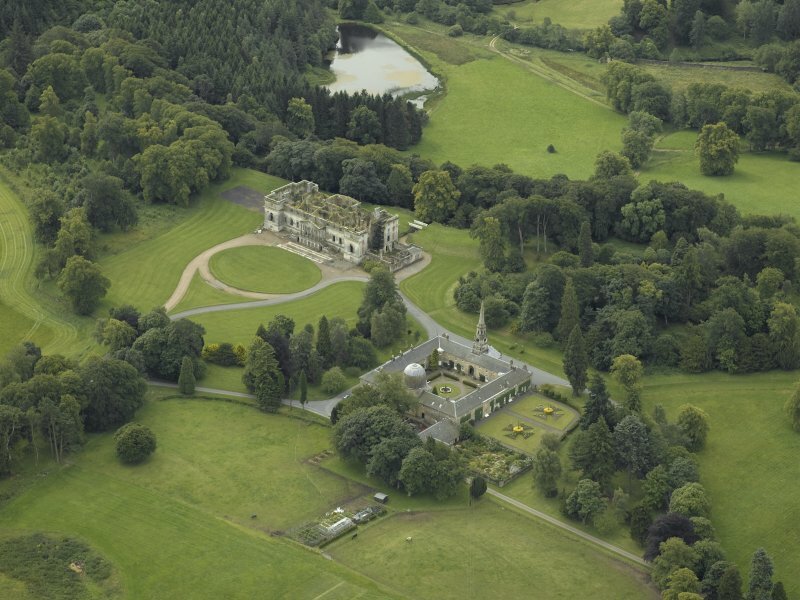 Oblique aerial view of Penicuik House, looking SE. Digital copy of detail of portico. 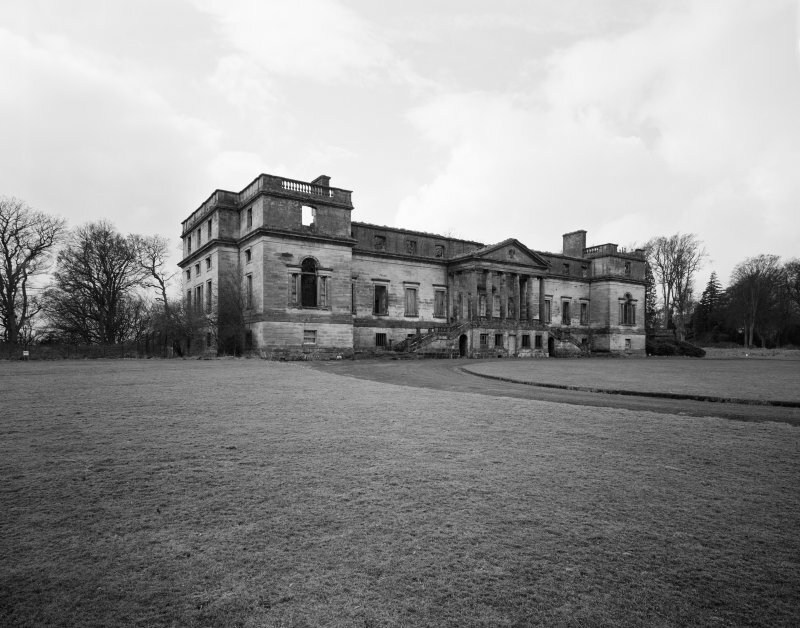 Digital copy of ink drawing of reconstruction of Penicuik House, Midlothian. 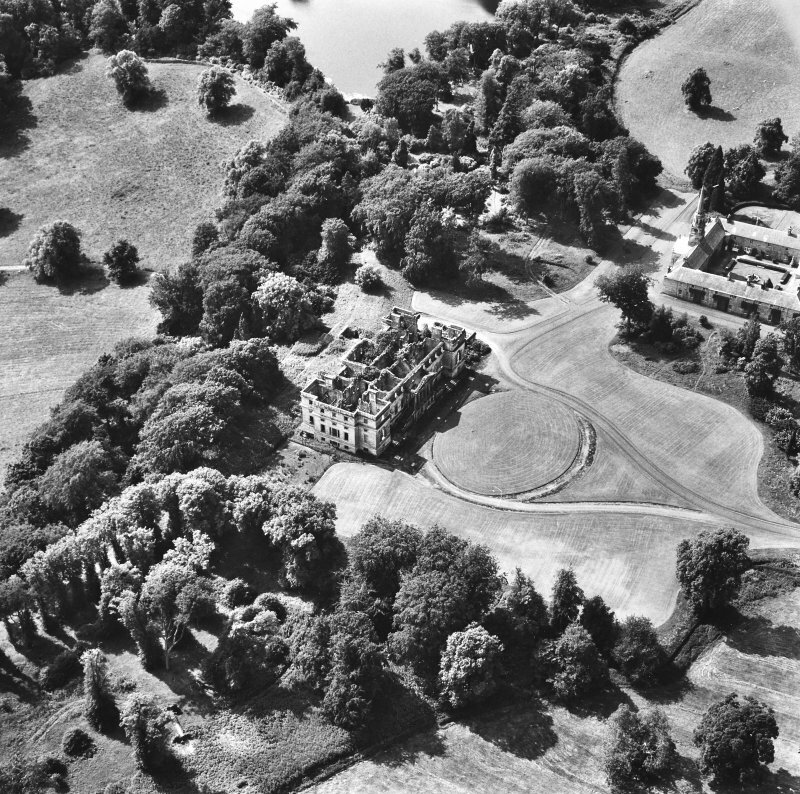 General oblique aerial view centred on the house and policies, taken from the SW.
General oblique aerial view centred on the house and policies, taken from the W.
Oblique aerial view of Penicuik House, looking WSW. 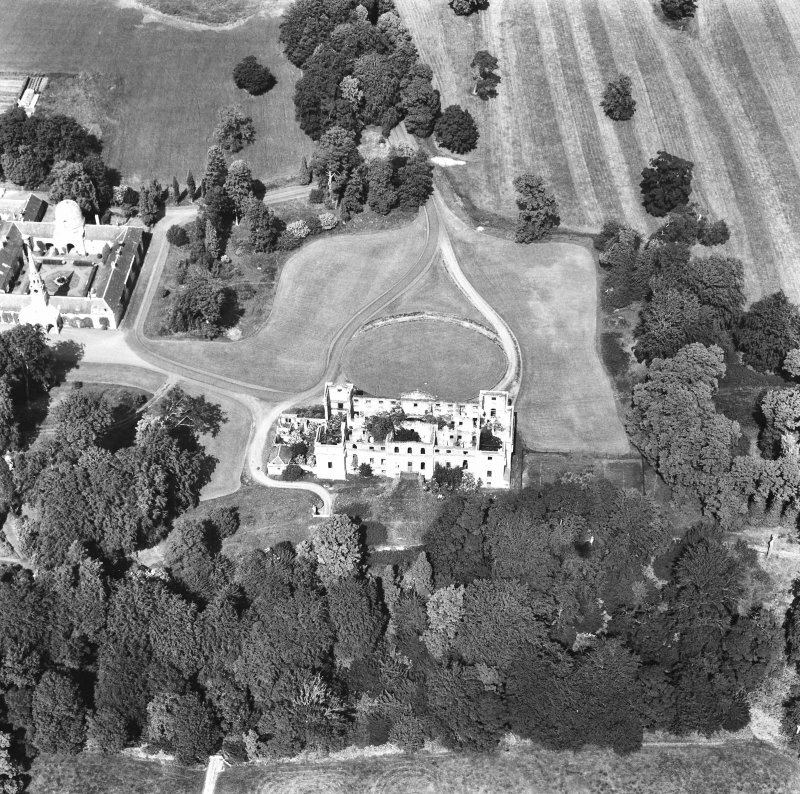 Oblique aerial view centred on the stables with the ruins of the house adjacent, taken from the NE. 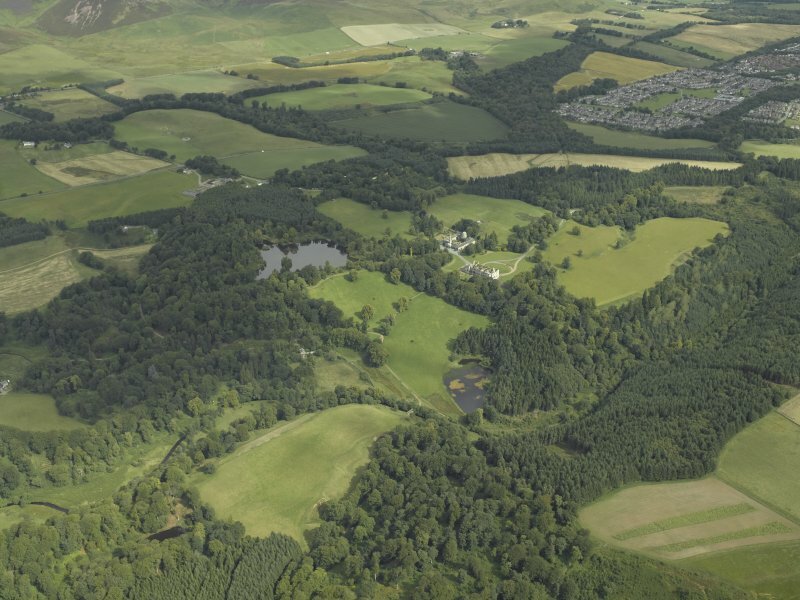 General oblique aerial view centred on the house and policies, taken from the S.
Oblique aerial view of the Penicuik House and stables, looking S.
Oblique aerial view of Penicuik House, looking S.
Oblique aerial view of Penicuik House, looking SW. Photographic copy of engraving showing view of Old Pennycuik House. 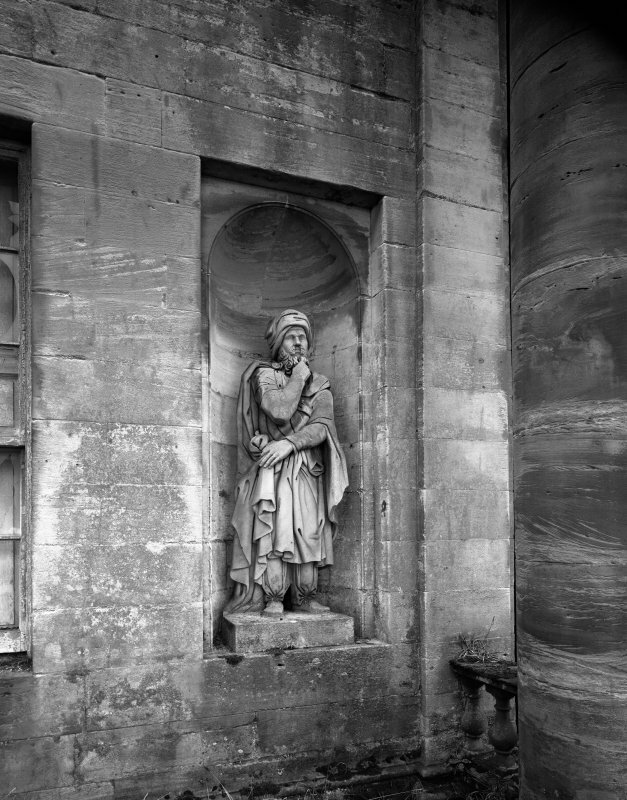 Digital copy of detail of statue on NE facade. Digital copy of interior. 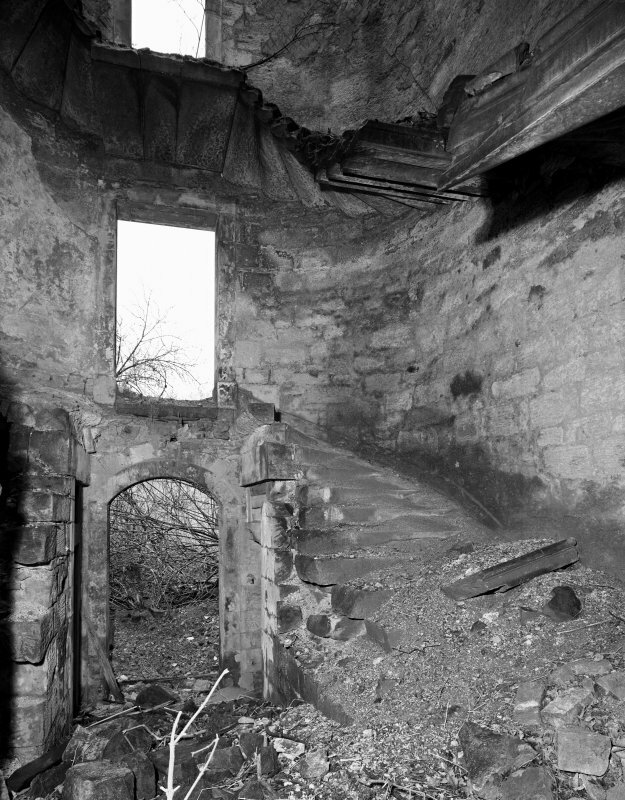 View of staircase. 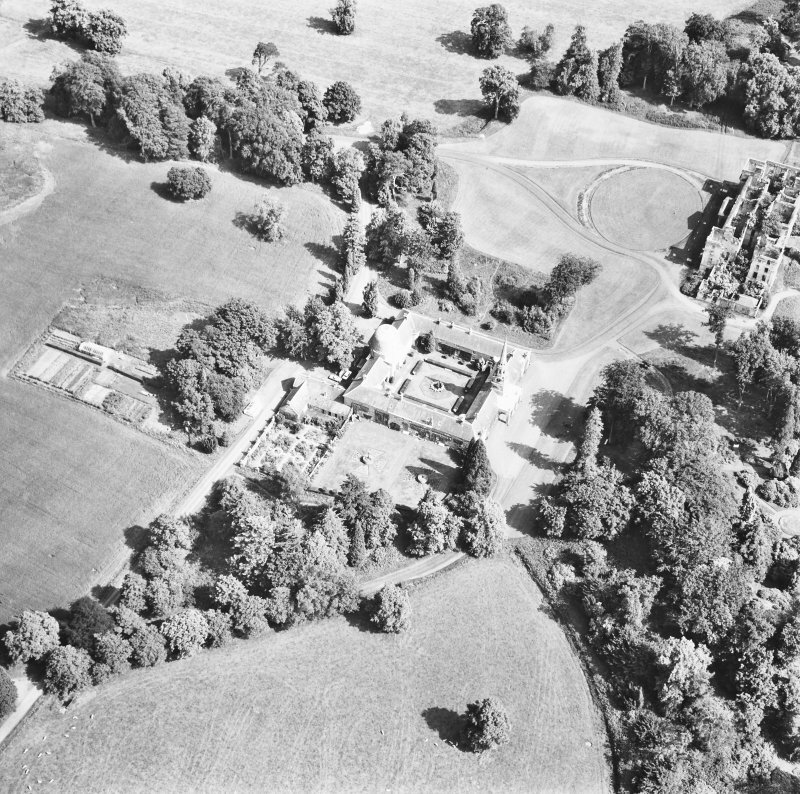 Oblique aerial view centred on the stables with the ruins of the house adjacent, taken from the SE. Photographic copy of drawing of 1782 showing plan of staircase ceiling. 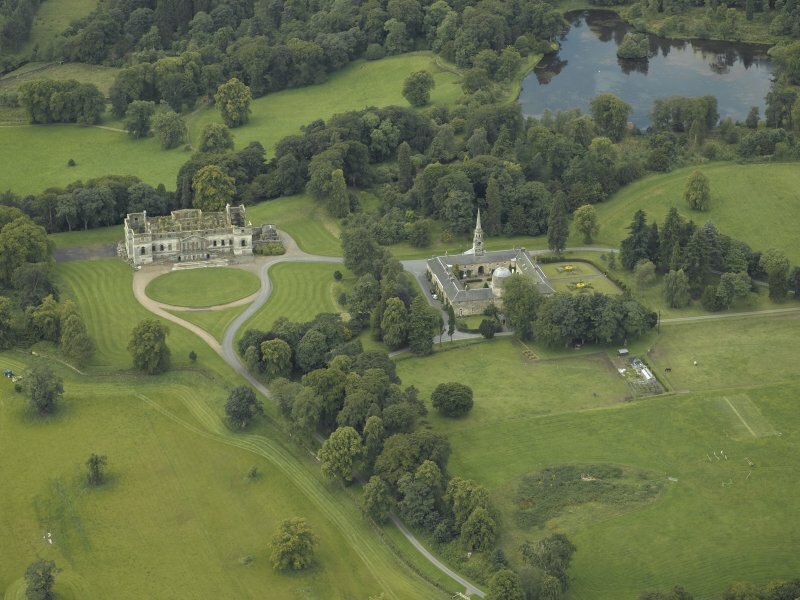 General oblique aerial view of the Penicuik House and stables, looking W.
Digital copy of interior. View of entrance hall. 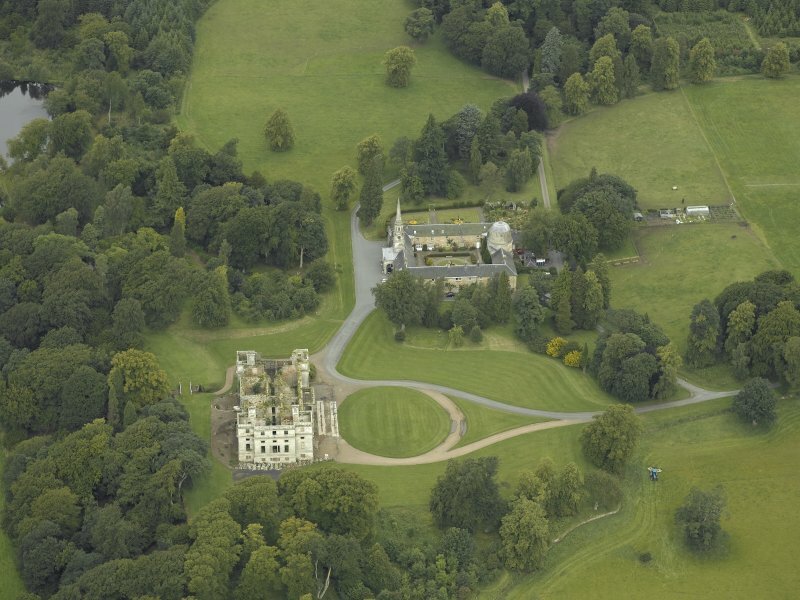 Oblique aerial view centred on the ruins of the house, taken from the NE. 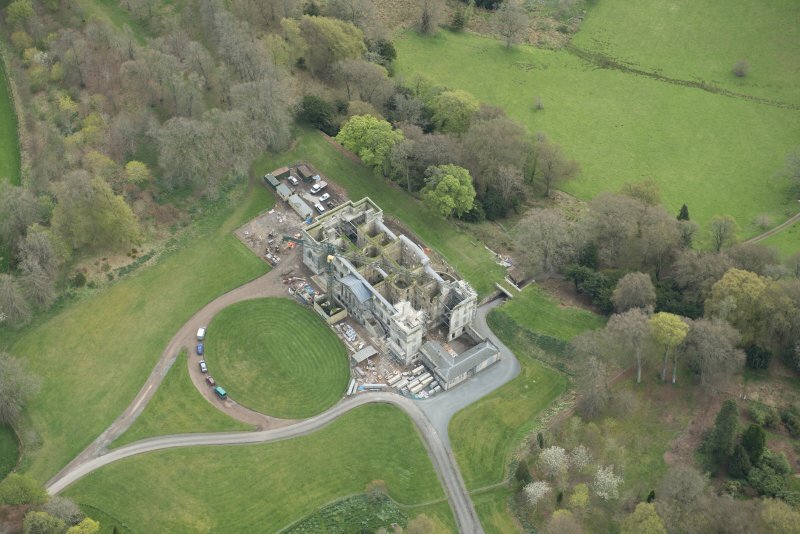 General oblique aerial view centred on the house and policies, taken from the E.
Old Penicuik House. Built 1761. 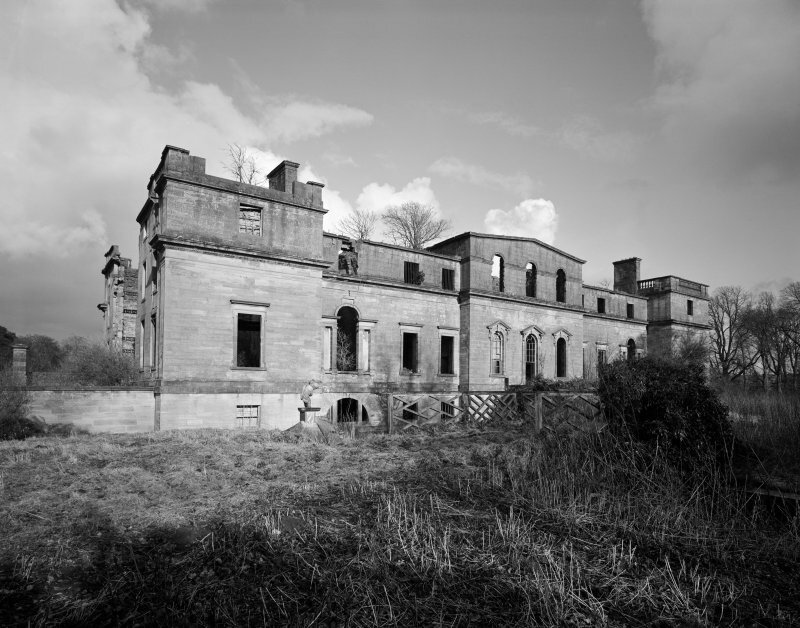 Burnt 1761, burnt out in fire 1899 (SDD List 1964). 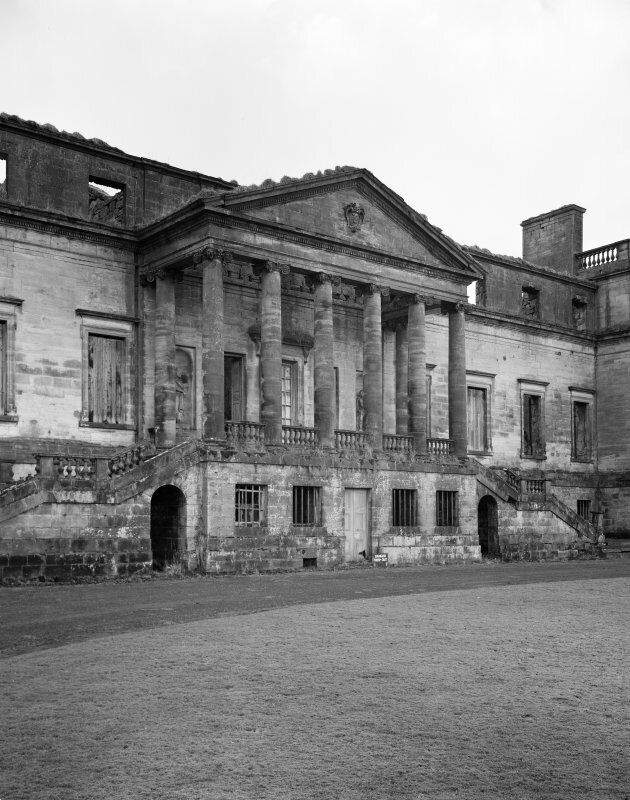 Penicuik House [NT25NW 25] and its stables [NT25NW 26] were built in 1761. 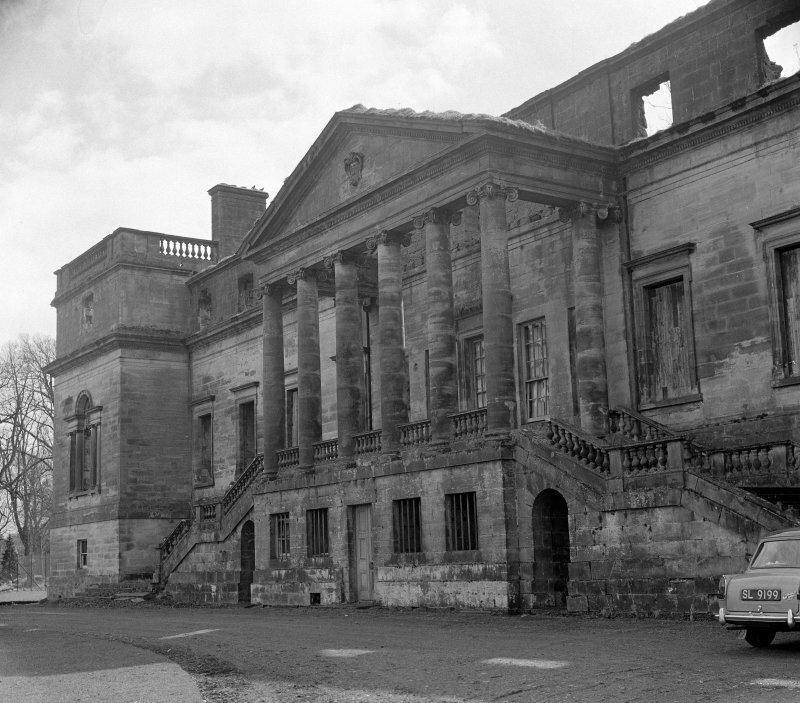 Following a fire at the house in 1899, the stables were converted into the new family residence, sometimes referred to as New Penicuik House. For architectural notes please consult [NT25NW 25] and [NT25NW 26] as many notes apply to both the house and the stables (new house). 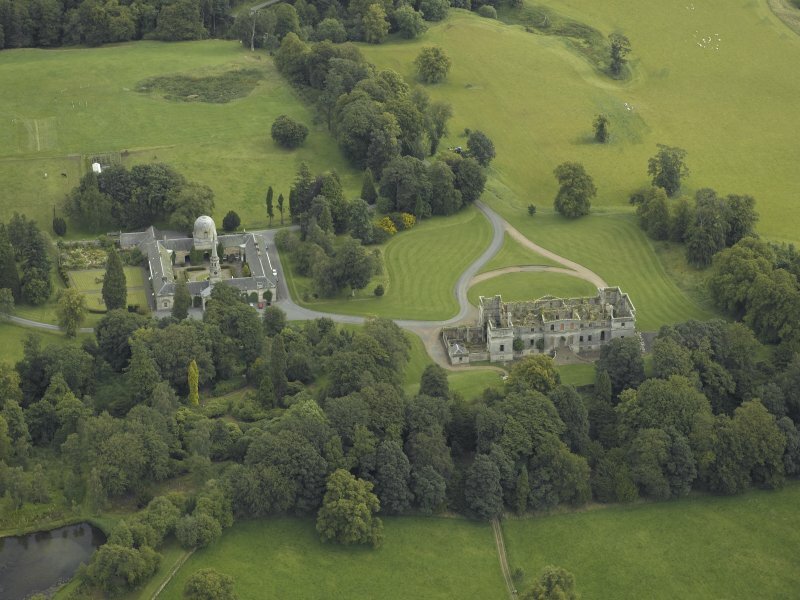 Description of a visit to Penicuik House. Letter from [?Andrew] Barclay to William Charles Little. 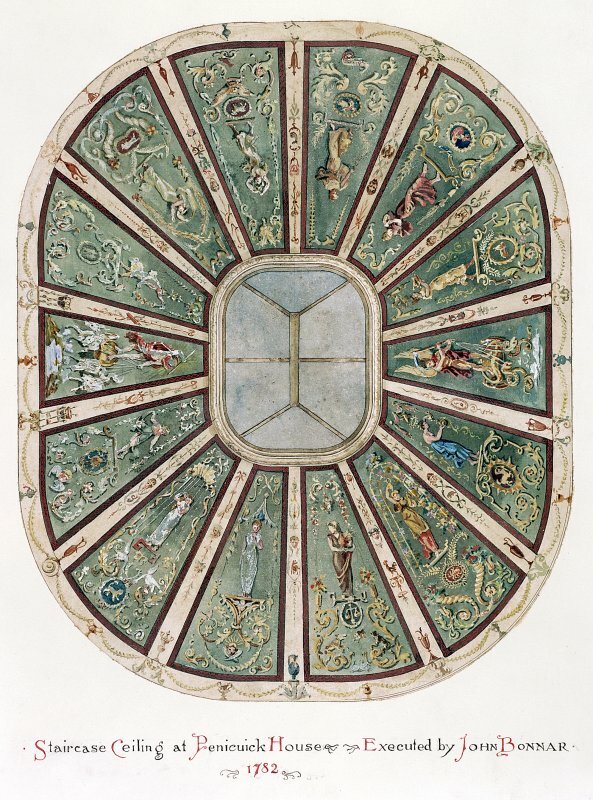 He describes the approach to the house, the Walks in the grounds, and an antechamber in the house 'the roof of which goes up like a pyramid'. Liberton Papers and Correspondence 1558-1793 (page 94). The building of a family house. Advice by Sir John Clerk. Workman's accounts (3). Accounts for stucco windows, 28 balusters, slates and wright work (Jo Johnston). Mason's account for arching the windows of the house and pointing the cornice. 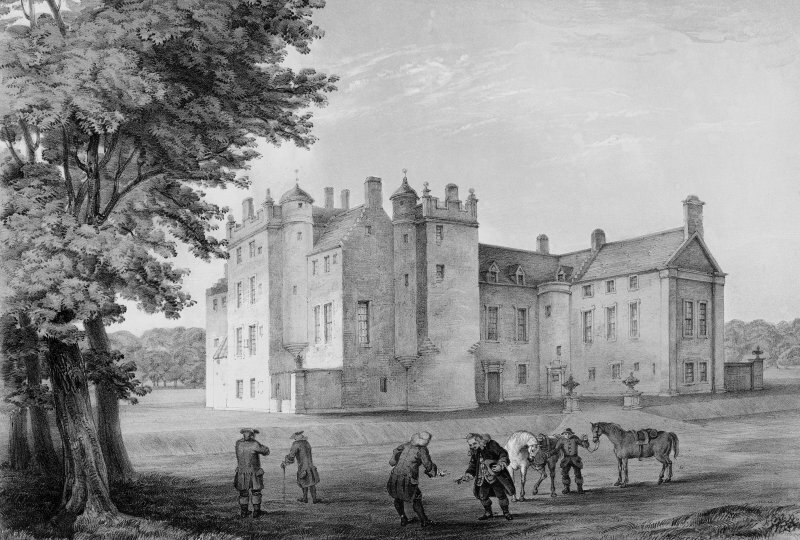 Barony bought 1656. 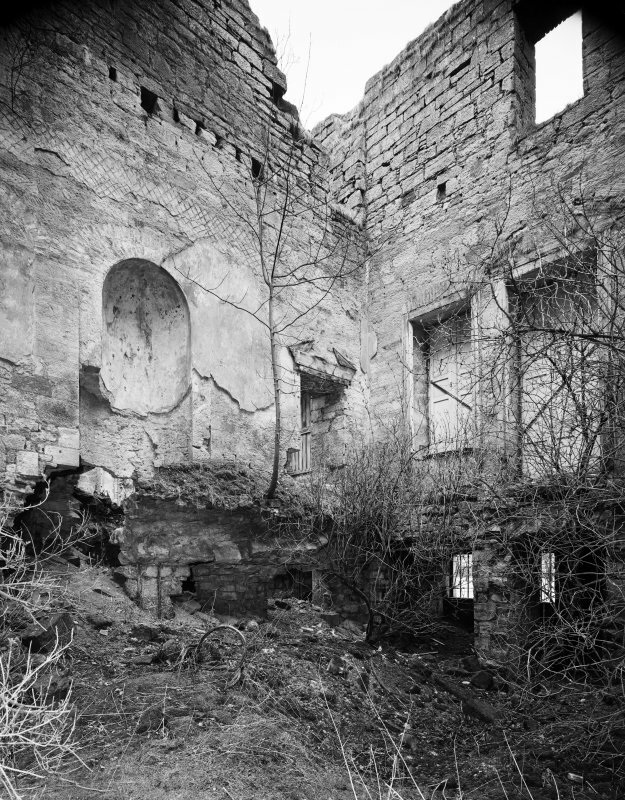 House of Newbigging consisted of a round stair and 3 or 4 rooms. Additions. A square building containing dining room and drawing room. A row of unequal buildings on N side. Offices. (after 1674). Removal of vaults. Adding of "a building of communication". 1692. Jambs built. By 1722 these were where the charter and chaplain's rooms were. 1878-1908. 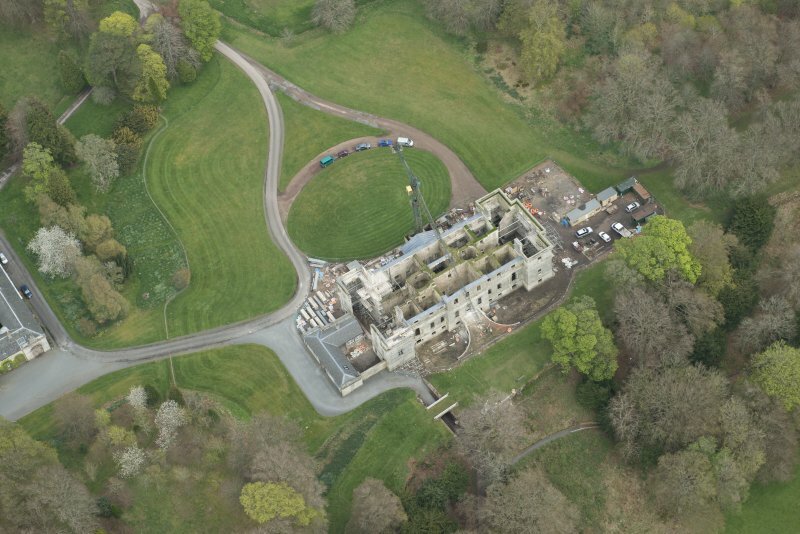 Estimates for repairs and alterations at Penicuik House. Includes work in dining room, dome roof, clock, fountain and gas supply. 1762. 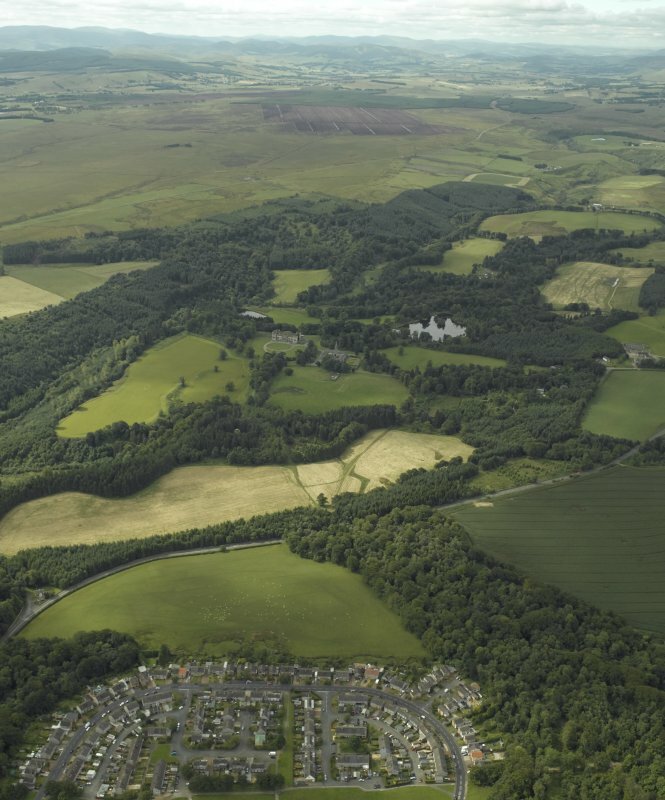 Plans for buidling a new house at Penicuik. Letter from Robert Clerk to [Sir James Clerk] criticising Sir James' plans for building and suggesting various alterations. Letter was sent to Robert Adam and received his approval. 1761-67. Building and furnishing of the new house and offices of Penicuik. Account book includes payments to Mr Adam, Mr John Adam, Mr John Baxter, Architect. [Alexander] Runciman, artist, Mr Anderson, carver, Mr Thompson, carver and Dougal McClarin, gilder. Cost: #14248. 6. 9. 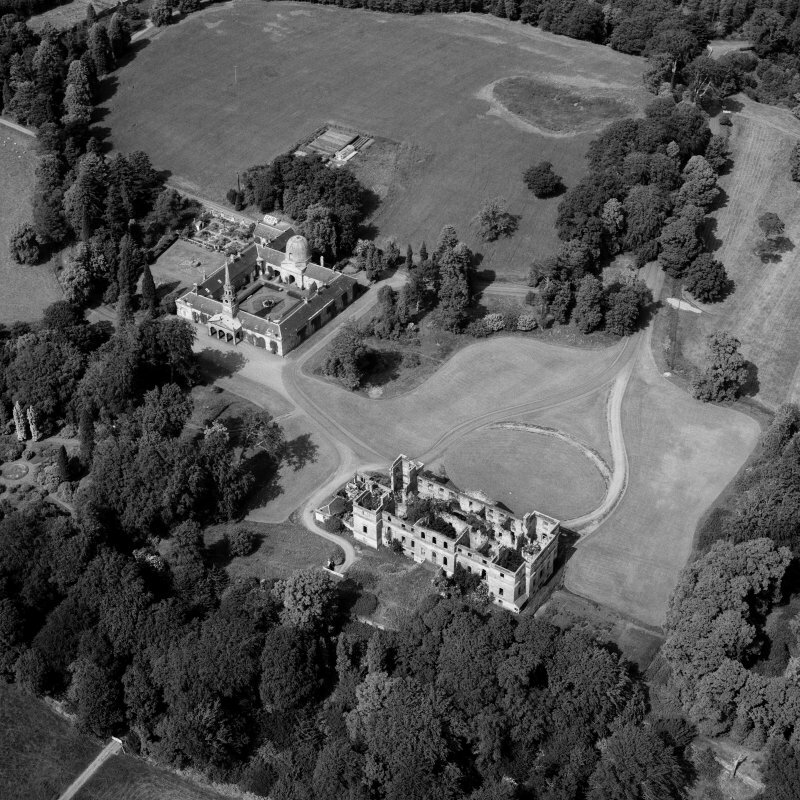 John Baxter architect copied Sir James Clerk's draughts & appears to have been in charge of building. 1764. Payment to Mr John Adam. Frequent payments to Messrs Runciman. 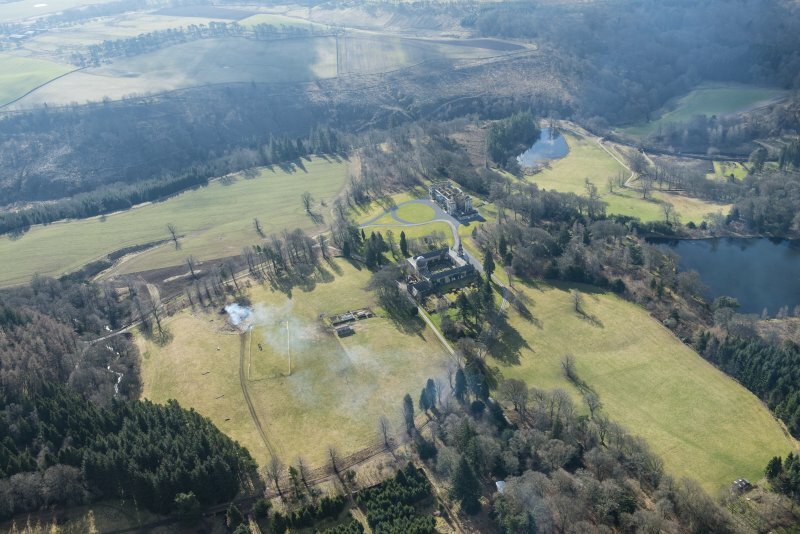 Papers relating to the fire at Penicuik House. (16). Accounts and report on work by James Tait, builder. 1680-1700. Contacts. Additions Pennycook House. Sir John Clerk - masons & slaters. & Accounts. N.D. 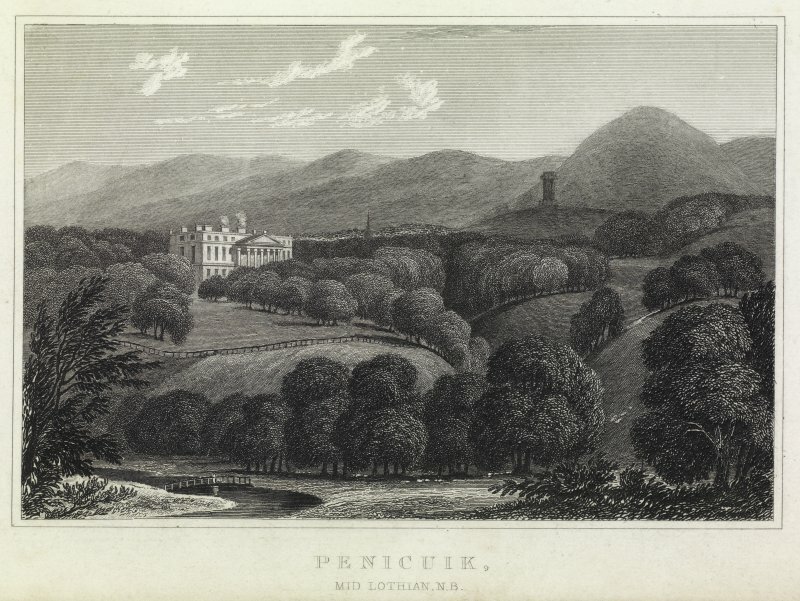 Sketch of [Penicuik House?]. 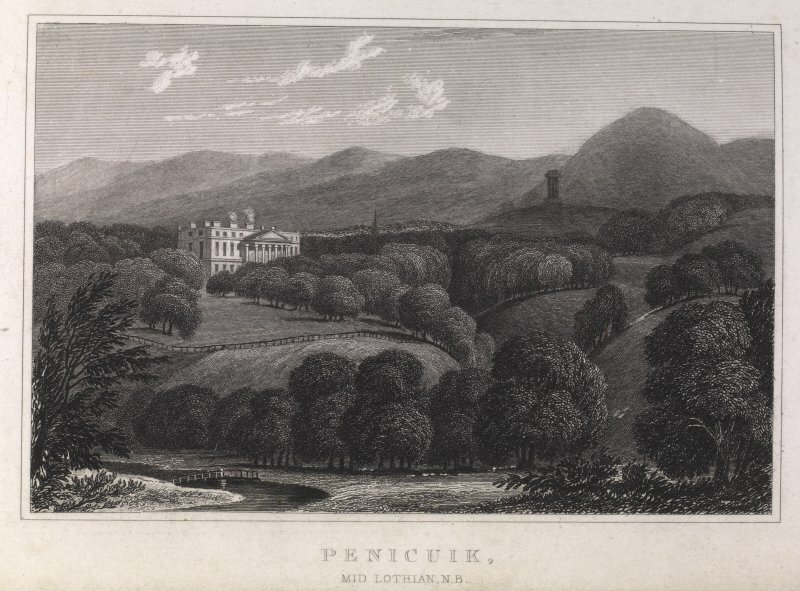 19th c. Account of the house of Penicuik and its surroundings. Inventory of dimensions and account of wright, plaster and slater work. 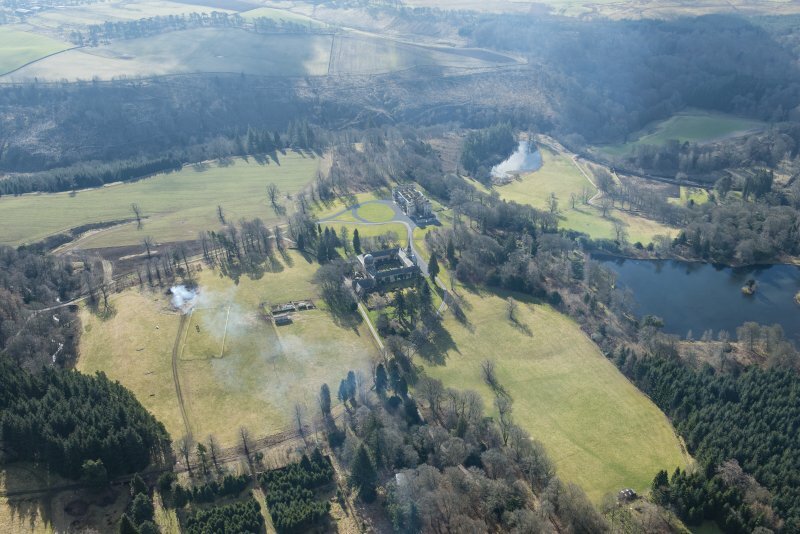 Papers relating to the fire at Penicuik House (16). Accounts and report on work by James Tait, builder. Two chimney pieces. Commission to Sir James Clerk. John Baxter, architect writes that two of the chimney pieces are finished and have given great satisfaction in Rome. The one with the Cariatides is mentioned specially. 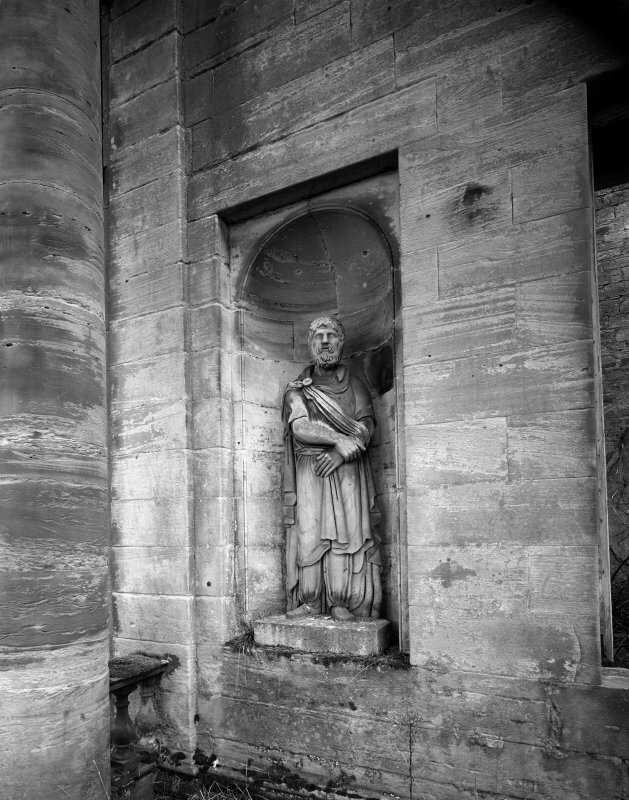 Drawing of Roman sculptures at Penicuik House. They have been found in 'a littile temple near Midlebie'. Defence of the architecture of his house. Copy of a letter from Sir James Clerk to his cousin Col. Clerk. Progress in building. 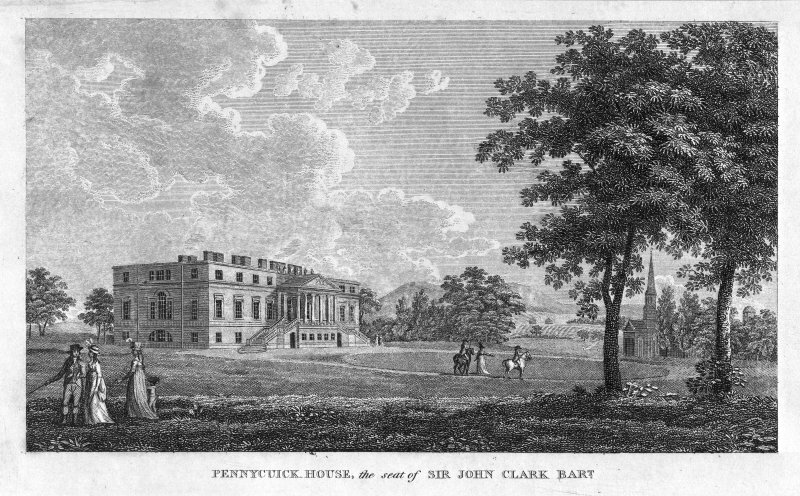 Letters to John Clerk of Pennycook, while in France from Elizabeth Henderson, his wife. 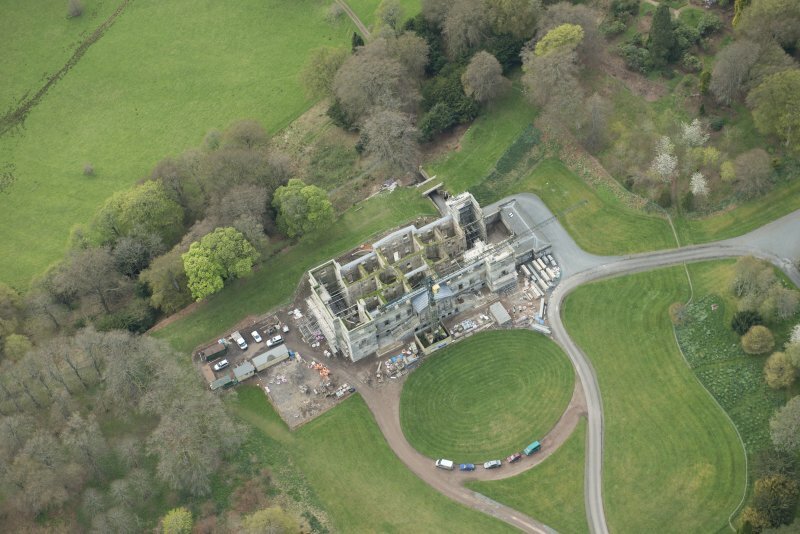 Estimates for repairs and alterations at Penicuik House. Include work in dining room, Dome roof, clock, fountain and gas supply. 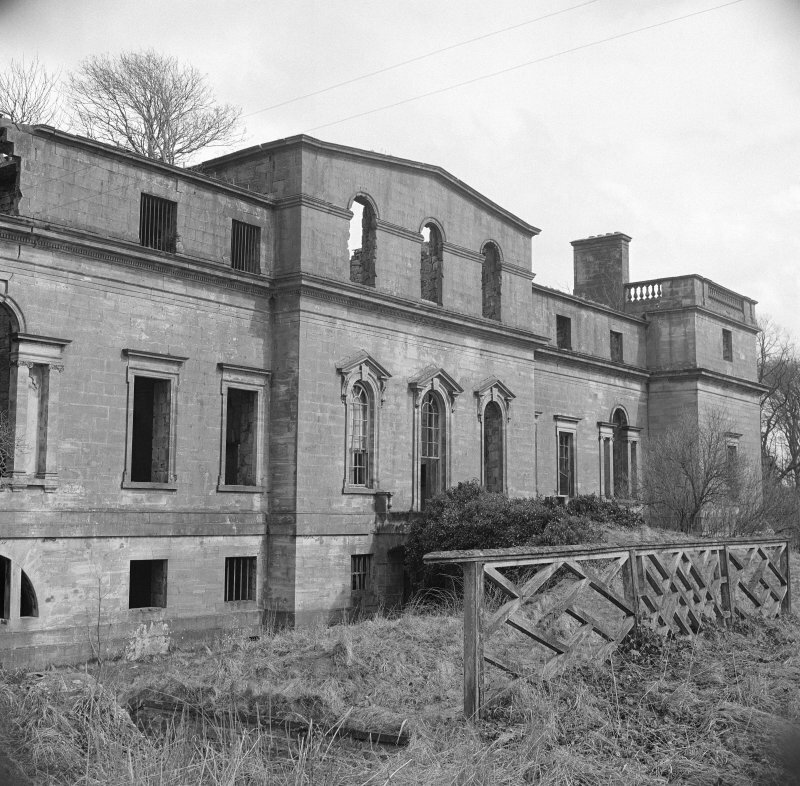 Building of a bridge under the approach to Penicuik House. The bridge is to have 3 arches of 20 feet span and about 40 feet high. made safe elevations and floor plans are being created, and these will contribute to the production of a complete drawn record of the house. NT 2176 5925 (centred on) A ground resistance survey was carried out on 21 November 2011 and 22 April 2012. 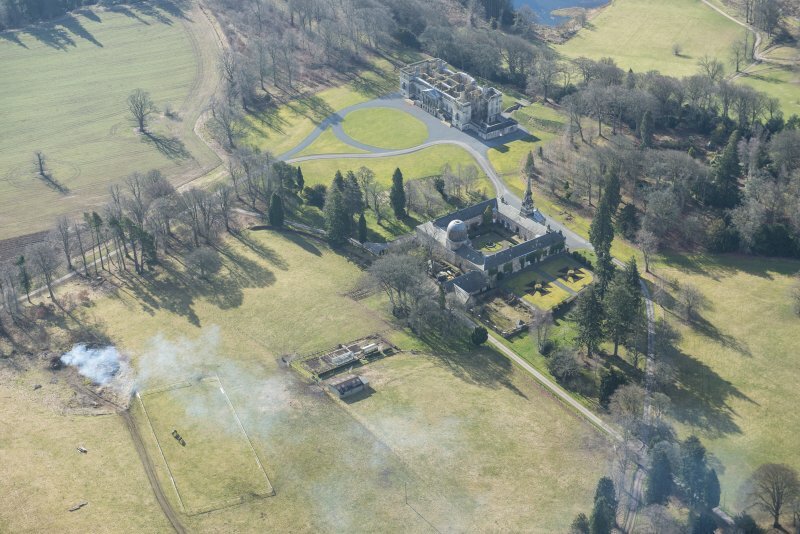 The survey covered a 120 x 80m area in front of Penicuik House, which was severely damaged by fire in 1899. 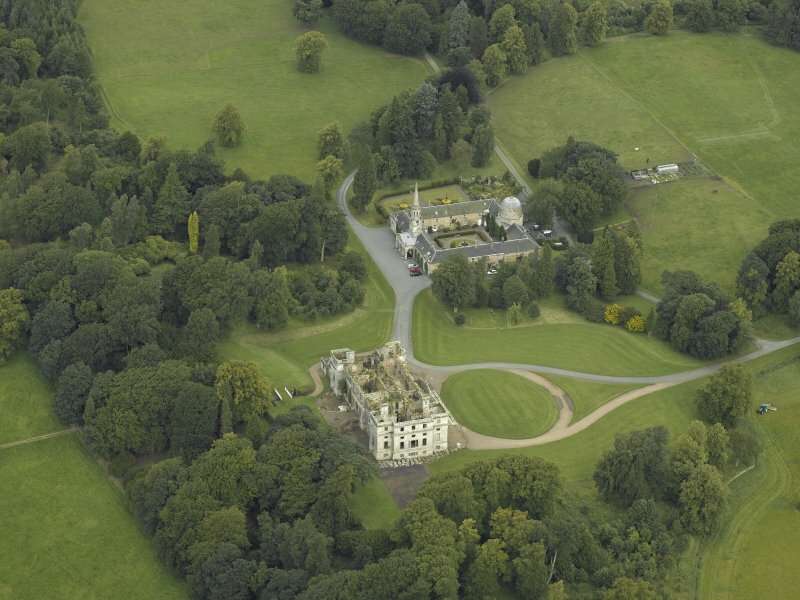 The area surveyed was bounded by the house remains to the S, the estate ha-ha and wooded area to the N and E and the boundary fence of the stable block to the W. The surveyed area also included the access road and turning circle to the N of the house. 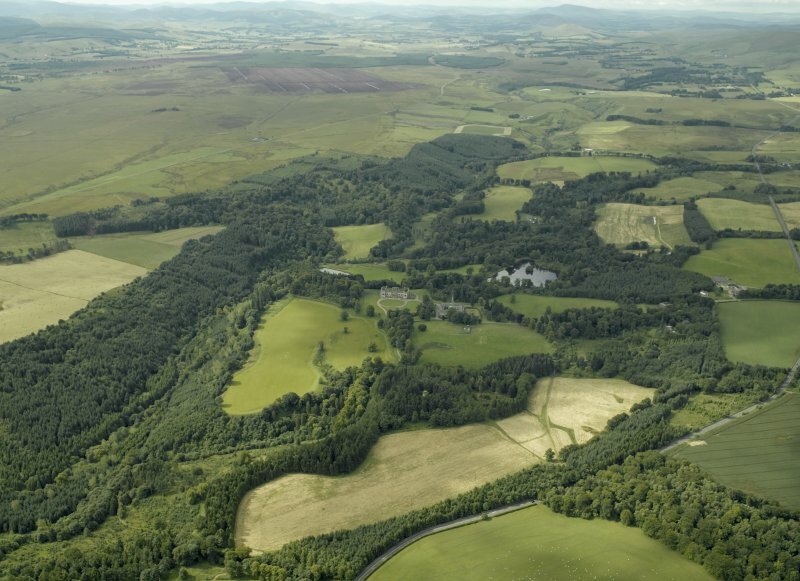 The work aimed to locate any evidence of the former Newbiggin House which was demolished in 1761. 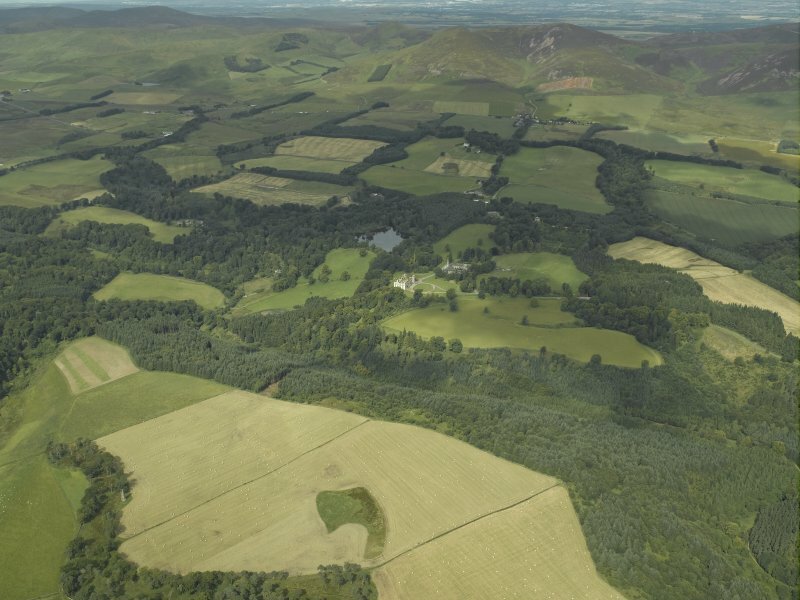 A band of higher resistance recorded to the N probably represented made ground of redeposited material, but linear anomalies to the S and E might represent service trenches or structures associated with the earlier house or garden. 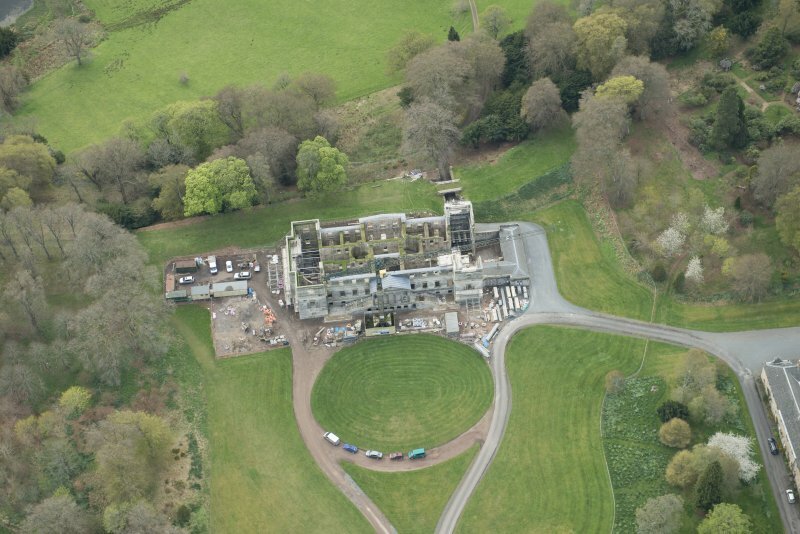 NT 21726 59208 A programme of archaeological monitoring, recording and excavation has been ongoing in 2011 as part of a long term project to stabilise and conserve Penicuik House. This year archaeological recording focused on drawing the interior elevations of the two principal central areas of the house. Details of the internal layout of the central part of the house were revealed, including a section with a timber floor, a fireplace and plastered walls. The basement appears to have been for storage, with brick areas and stone shelves for the storage of barrels. To the E of the main hall a number of ceramic and metal flues were revealed in a badly damaged section of wall. These appeared to connect to the boiler found in the sub-basement excavated last year. A detailed record was made of the flues before the wall was reinstated. 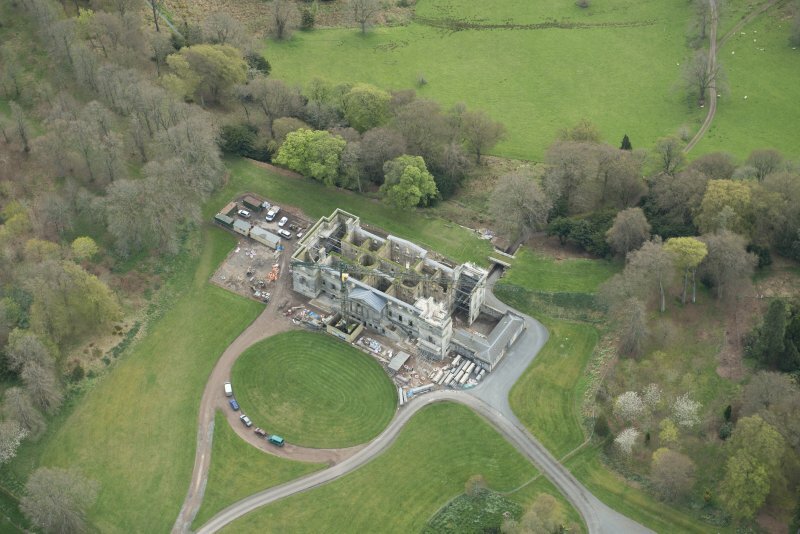 NT 21726 59208 A programme of archaeological monitoring, recording and excavation has been ongoing in 2012 as part of a long term project to stabilise and conserve Penicuik House. 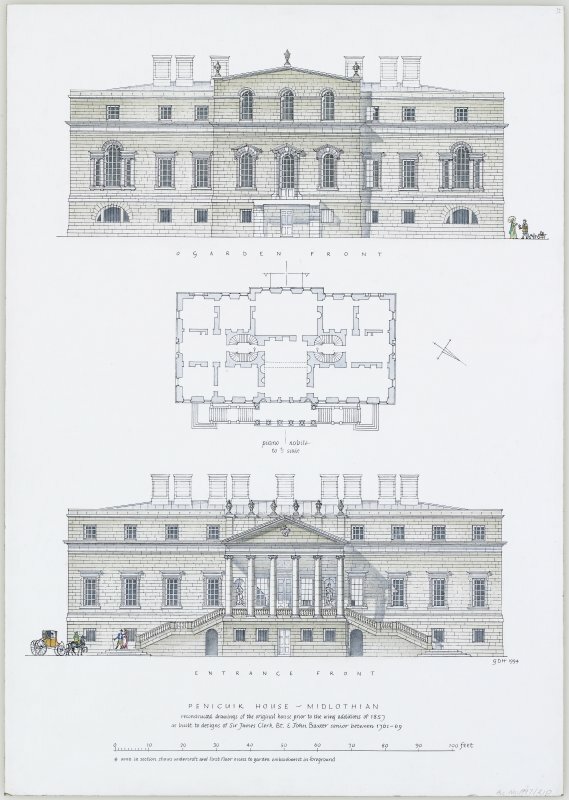 The measured survey of the interior elevations of the principal reception rooms, in the central block of the house was completed at the end of 2011. 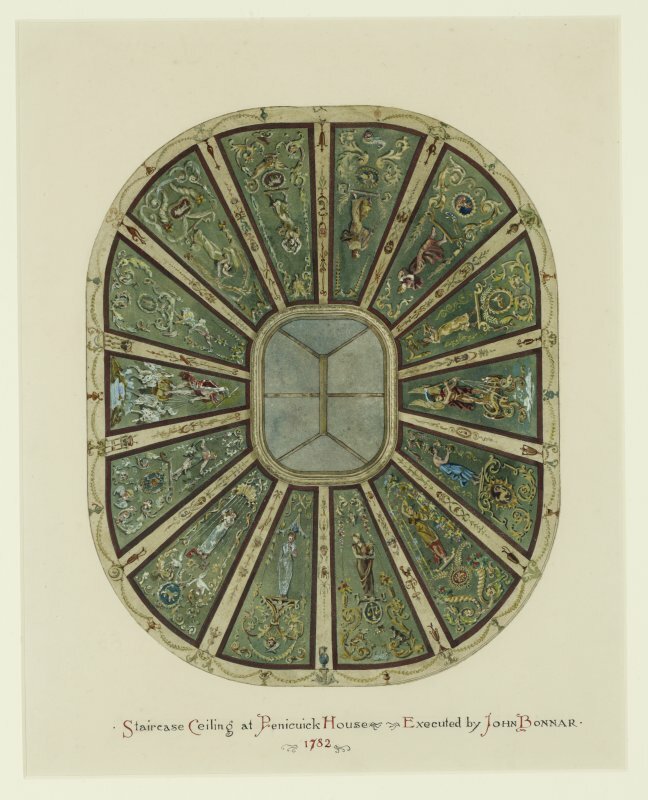 This work, which examined the entrance hall and the Ossian Salon at the S end of the house, provided a greater understanding of the build up of wall linings and integrated decoration. The elaborate set of three arch-headed, plastered niches positioned centrally on the E and W walls were of particular interest. The curve of the niches was formed by bedding broken pantile into a thick layer of course lime mortar. Several layers of successively finer plaster were then applied to form a very smooth finish. A double line of timber dooks visible on all four elevations indicated where the cornice would have been in the ground floor room. Along the E wall the width of the skirting was visible as a red band along the masonry. Although contemporary illustrations of the Ossian Salon survive, the survey added new details, including an opening to the right of the fireplace at the E end of the room. The walls are covered with timber dook holes which would have supported timber batons for the lath and plaster. The lines of dooks indicate the height of the cornice and possibly a dado. The complete timber facings on the S-facing windows survive with traces of white or cream paint. Each of the three S-facing windows had undergone alterations, and evidence in the masonry suggests that they had been raised. Excavations within the house continue to uncover surviving flagged floors, together with evidence of how the heating system in the house operated. 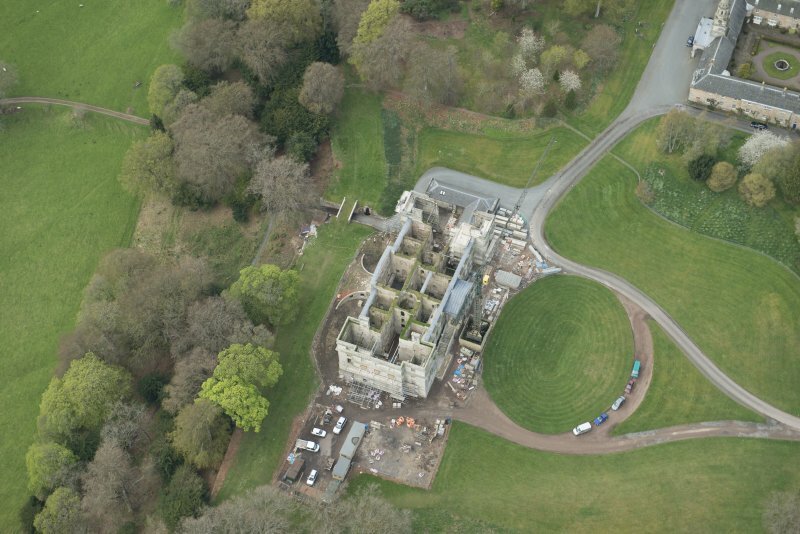 The extensive vaulted cellars to the S of the house were investigated and recorded for the first time this season. They are accessed from a gated doorway below the entrance ramp, and extend for a total of 23m to the S, where a second entrance opens onto a terraced walk. Each of the rooms without a window had a light shaft from the grassed area above, which would presumably have had a grill covering. They are now topped with slates and turf has grown over them. The main part of the cellar is divided into seven rooms. Two further small rooms can only be entered from outside, on either side of the main cellar entrance. Each of these rooms is lit by a large barred window. 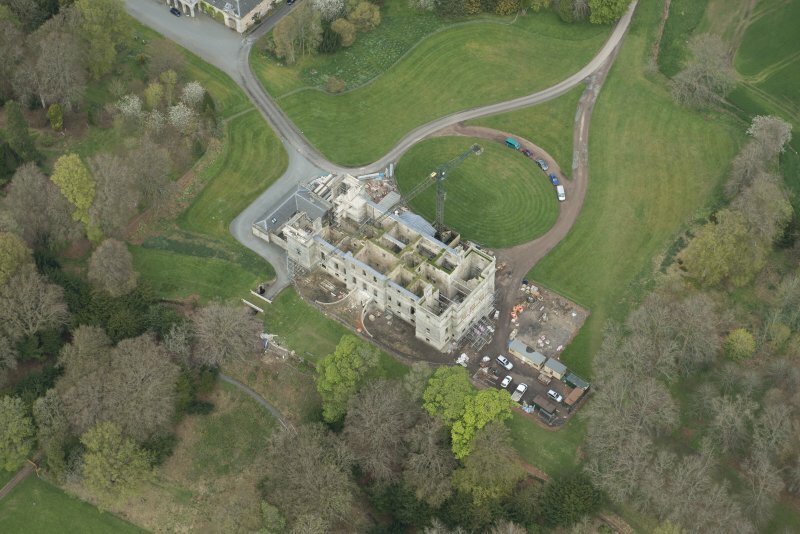 The ongoing process of clearing the rubble at the E end of the main house has made it possible to begin examination of what would have been the external E wall of the house before the addition of the wings designed by David Bryce. The wall has been significantly altered and the N end reduced in width to accommodate an additional staircase. Clearing and excavations in the E Bryce wing of the house revealed a floor structure that parallels the one recorded in the W Bryce wing, but differs from the floor structure in the original part of the building. The extensive areas of thin flagstones that survive in the E wing are supported on a network of crudely built dwarf walls interspaced with cavities, whilst the slabs in the older part of the house had been placed directly upon brown sand. Comparatively little of significance was recovered during rubble clearance in the E part of the house. A collection of iron and other metal fixtures and fittings was recovered, and accumulations of melted lead provided further evidence of the fire that destroyed the building. 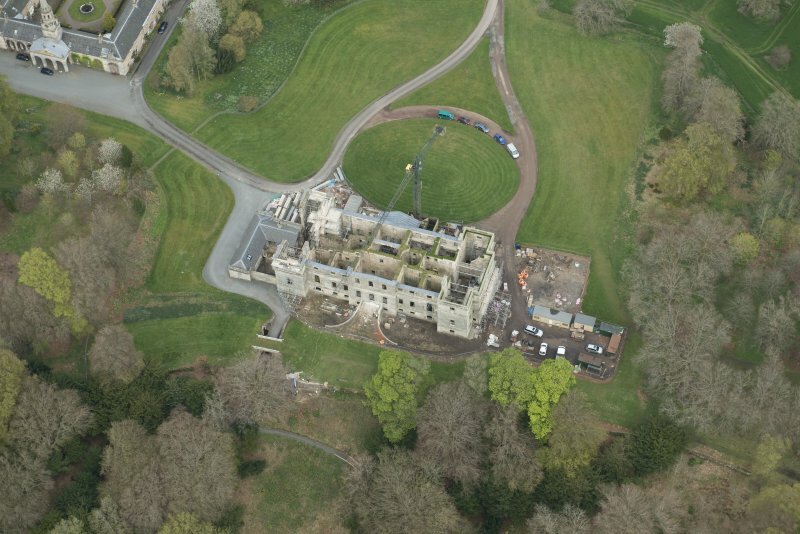 In addition to the building recording a geophysical survey was carried out by members of EAFS. 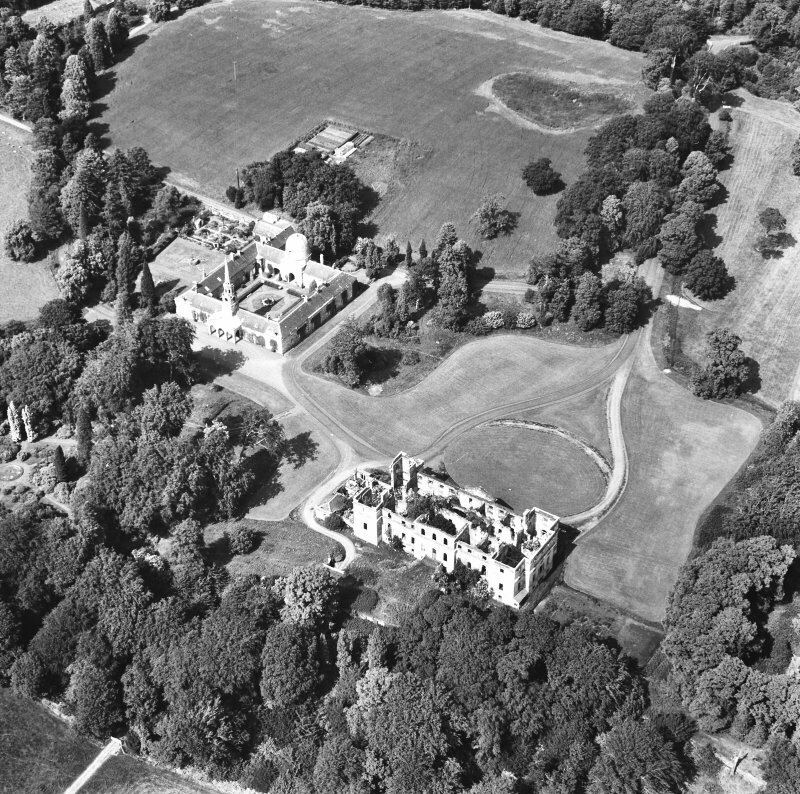 Cartographic evidence suggested that Newbiggin House, which was demolished to allow the construction of Penicuik House, was located largely beneath the footprint of the upstanding building, with a small part extending on to the lawn. 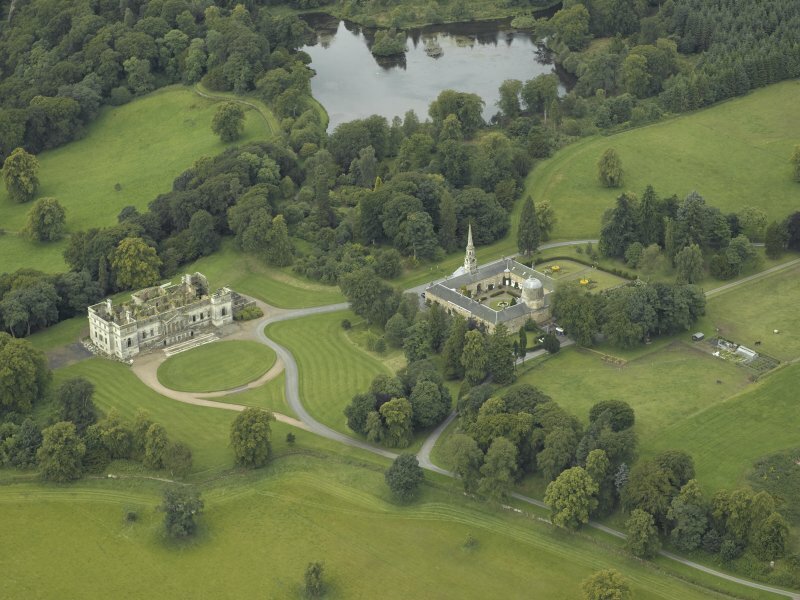 EAFS expressed an interest in carrying out a geophysical survey in order to determine if any remains were detectable buried beneath the lawns. The results of this survey are presented below. 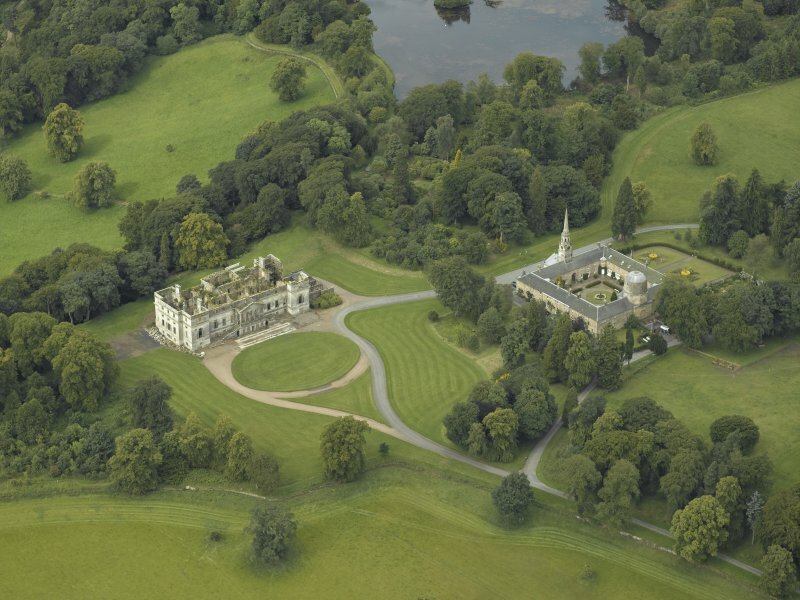 Newbiggin House. Traces of masonry relating to a roof line in the E wall of the main house may represent evidence of a small pavilion.